CTM Web Services - the EdWare Advantage! Years of software development in support of our project work have given us an impressive proprietary code base, which we refer to as "EdWare.". Many of these applications are unique - there's no commercial equivalent. With EdWare on the Web you can add new capabilities, streamline your current processes and elevate your projects above the "cookie-cutter" look so common in maps produced by the dominant commercial packages. For many users, these web services can substitute for expensive desktop GIS software - all you need is a web browser with an internet connection. For others, EdWare on the Web enhances your GIS capabilities and improves productivity. 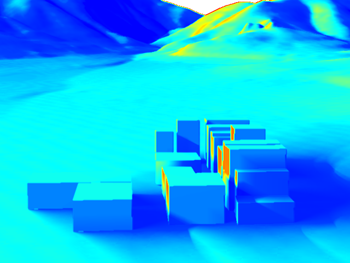 The "Elevation Server" is a versatile service that can provide DEMs (Digital Elevation Models), color elevation images, hillshade renderings and slope analysis. 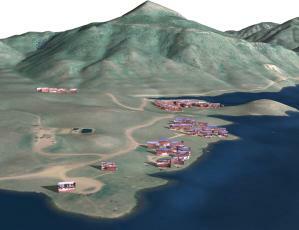 With elevation data covering the entire globe, chances are we already have your area at the level of detail you need. 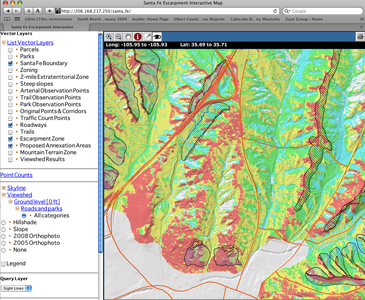 We've also got "mash-ups" that let you combine hillshading with other imagery - like air photos and satellite shots. 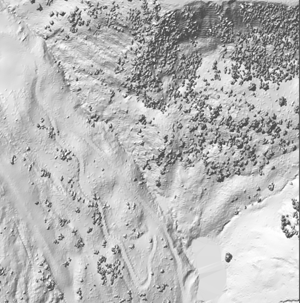 Got your own high resolution lidar data? EdWare on the Web can generate DEMs and TINs (Triangular Irregular Networks) from LAS-format files. 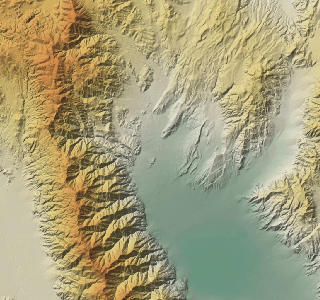 You can access the resulting data directly, or mash this up with the elevation server to get hillshade, slope or elevation-based color images. Don't tie up your desktop: "click and forget" and let our servers do the heavy lifting! You'll get an email notification when it's done with a link to download your files. In the meantime, you can be using your desktop computer for other tasks without degrading its performance. 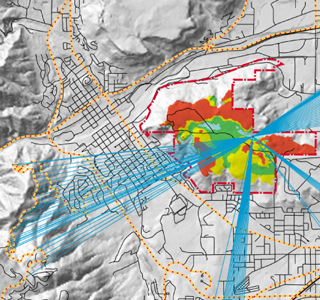 For years, CTM has used EdWare for visual resource inventory and analysis in support of open space master plans, EIS work and visual resource protection regulations. With EdWare on the Web, these capabilities are now available directly to you. EdWare on the Web provides viewshed mapping and our own skyline analysis, which has been the basis for a number of ridgeline protection ordinances. This lets you know where your critical visual resources will be visible from - an important step in protecting premier views and mitigating visual impacts of new construction. Solar incidence studies cover a range of projects - from assessing solar impacts of new building construction to siting solar arrays for maximum incident energy. All require a knowledge of the sun's location on specifics dates/times, the angle of incidence of solar radiation with the landscape or structure and analysis of shadow-producing obstructions. With EdWare on the Web, you can map solar incidence / shadows for a particular date and time, or integrate incident solar energy over a time interval. The foundation of CTM's "brand" is based on the quality of our imagery - including 3-dimensional images. 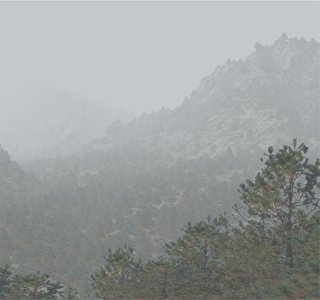 Some projects require photo-realistic renderings, while others might require some abstract cartographic theme to rapidly convey concepts to the viewer. EdWare on the Web now brings all these capabilities to users! Our software has been used to produce imagery for large-format printing projects, animations for films and numerous other digital and print applications. If your organization has a significant investment in buildings, roads and other infrastructure, managing these assets is a considerable task. We've developed a web-based management system that integrates a variety of open source components with a suite of EdWare tools to provide a comprehensive solution. To learn more about the EdWare Asset Manager click here.